ZHANG Lihua, ZHANG Liyan, ZHANG Xiaokang, XU Chaolong, ZHOU Yi. 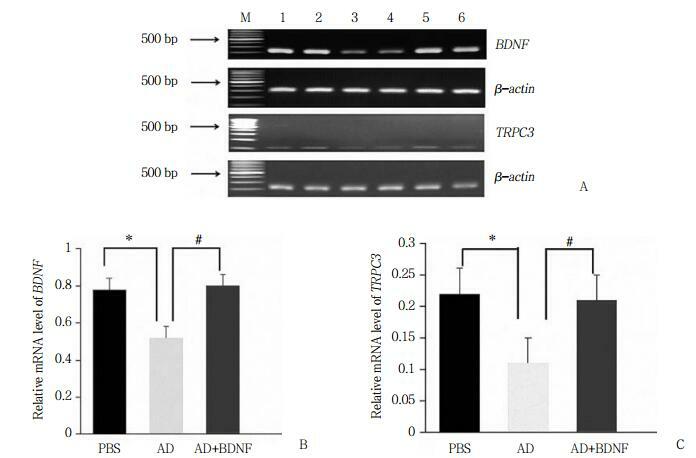 Relationship between BDNF and TRPC3 in a Rat Model of Alzheimer's Disease Induced by β-amyloid Protein[J]. Journal of China Medical University, 2018, 47(3): 217-221. Abstract: Objective To investigate the expression and relationship of canonical transient receptor potential channel-3 (TRPC3) and brain-derived neurotrophic factor (BDNF) in the hippocampus of a rat model of Alzheimer's disease (AD).Methods SD rats were randomly divided into PBS, AD, and AD+BDNF experimental groups. AD models were generated by intracerebroventricular injection of β-amyloid protein (Aβ1-42). BDNF was injected via the lateral ventricle catheter after 14 days. The Morris water maze test was used to assess the spatial learning and memory ability of the rats. The expression of TRPC3 and BDNF mRNA and protein in the hippocampus were detected by RT-PCR and Western blotting, respectively.Results The Morris water maze test showed that the escape latencies of the fifth day in the AD group were longer than those in the PBS group (P < 0.05). The escape latencies in the AD+BDNF group were shorter than those in the AD group (P < 0.05). RT-PCR and Western blotting results showed that the expression of both TRPC3 and BDNF were reduced in the AD group compared with the PBS group (P < 0.05). 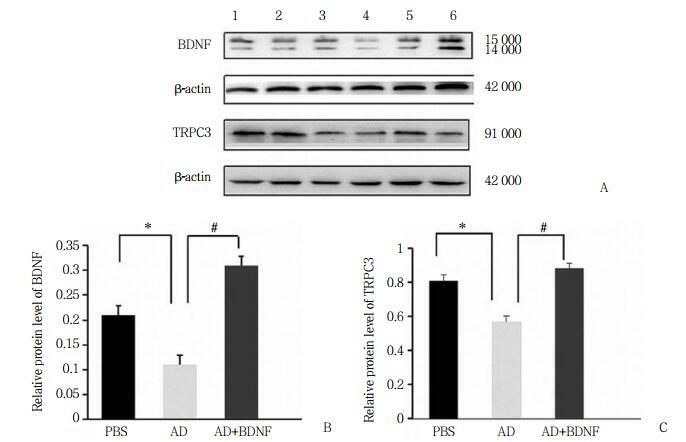 TRPC3 expression was increased in the AD+BDNF group compared with the AD group (P < 0.05).Conclusion The expression of BDNF and TRPC3 is decreased in the hippocampus of AD rats. An exogenous BDNF injection appears to improve the spatial learning and memory of AD rats that are impaired by a Aβ1-42 injection, possibly via TRPC3 upregulation, and may play a protective role in neurons.